Middleburg is located northwest of the center of Clay County at 30°3′3″N 81°54′7″W﻿ / ﻿30.05083°N 81.90194°W﻿ / 30.05083; -81.90194 (30.050783, -81.902013). Florida State Road Blanding Boulevard leads northeast 13 miles (21 km) to the Orange Park area and southwest 23 miles (37 km) to Keystone Heights. According to the United States Census Bureau, the Middleburg CDP has a total area of 19.6 square miles (50.7 km2), all land. The 4th Massachusetts Cavalry had a small skirmish before raiding Middleburg during the American Civil War on October 23, 1864. The next day the 4th Massachusetts Cavalry set fire to a number of buildings and a hotel. The Federals retreated across Black Creek burning a bridge in the process. The 2nd Florida Cavalry caught up with the retreating 4th Massachusetts Cavalry in a skirmish at Halsey's Plantation. Uncle Chaps, Podcaster, Blogger, and releaser of gas on the radio. ^ a b "Geographic Identifiers: 2010 Demographic Profile Data (G001): Middleburg CDP, Florida". U.S. Census Bureau, American Factfinder. Retrieved June 27, 2014. ^ "Middlburg, Florida, USA". h2g2.com. h2g2.com. Retrieved July 5, 2014. ^ "Middleburg". ccpl.lib.fl.us. ccpl.lib.fl.us. Retrieved July 5, 2014. ^ "Fort Heileman, Florida". archives.clayclerk.com. archives.clayclerk.com. Retrieved July 5, 2014. 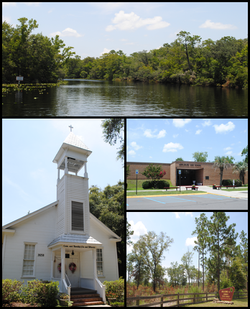 ^ "Clay County Public Library Historical Resources Page". ccpl.lib.fl.us. ccpl.lib.fl.us. Retrieved July 5, 2014. ^ "Calendar of Civil War Activity". archives.clayclerk.com. archives.clayclerk.com. Retrieved July 5, 2014. ^ "Florida State Marks - Clay County". Retrieved 2007-06-24. This page was last edited on 1 November 2018, at 11:57 (UTC).